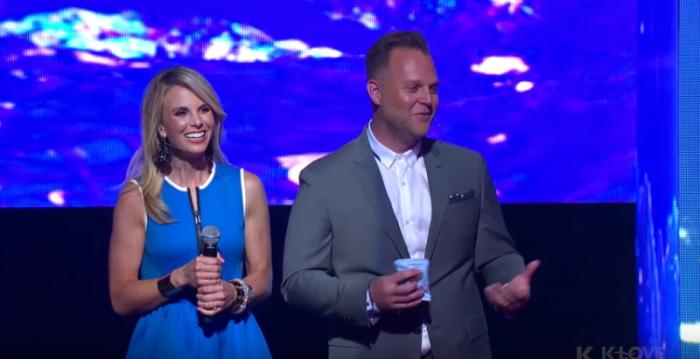 K-LOVE radio has announced the nominees for the 2017 K-LOVE Fan Awards where Elisabeth Hasselbeck and Matthew West will return as co-hosts for the annual event. The 2017 K-LOVE Fan Awards list was shared on K-LOVE Radio's Facebook page Wednesday where Hasselbeck and West were joined by K-LOVE artists to announce the nominees. K-LOVE radio has a weekly listenership of 14 million people, and is planning to host its annual weekend of concerts and family activities in Nashville, Tennessee, May 26–28 that will be capped off by the awards show. Fans began voting in December to choose the names of those who would be honored in each category. Fans' votes will also determine the official winners in each of the seven categories, including Artist of the Year, Male Artist of the Year, and Female Artist of the Year, among others. Voting opens on May 1. West and Hasselback are teaming up for the third time to host the fifth annual awards show. In 2015, while on the red carpet, The New York Times best-selling author and long-time supporter of Christian music, Hasselbeck said she believes she's doing what she's called to do, and is enjoying every moment of it. "When the spirit moves you, it's not like you can say no. However, God wants to use me for His glory, I have surrendered that to Him and His plan. I am thankful to be here with my family and let the kids see a big party for God, and meet all my favorite artists," she told BREATHEcast. "I'm just gonna have trouble focusing because I'm gonna be up there saying something and then spot TobyMac or Mac Powell. It's hard to be a major fan of K-LOVE and host, I think, so we'll see." The fan experience driven weekend will kick off with a concert featuring MercyMe, Lauren Daigle, Danny Gokey and Zach Williams in Nashville on May 26. For more information about the weekend event and awards show, click here. Big Daddy Weave "The Lion and the Lamb"
Natalie Grant "King of the World"
One Sonic Society "Great Are You Lord"
Phil Wickham "Your Love Awakens Me"
for KING & COUNTRY "Priceless"
Lauren Daigle "Trust In You"
Ryan Stevenson "Eye of the Storm"
7eventh Time Down "God Is On The Move"
Love & The Outcome "The God I Know"